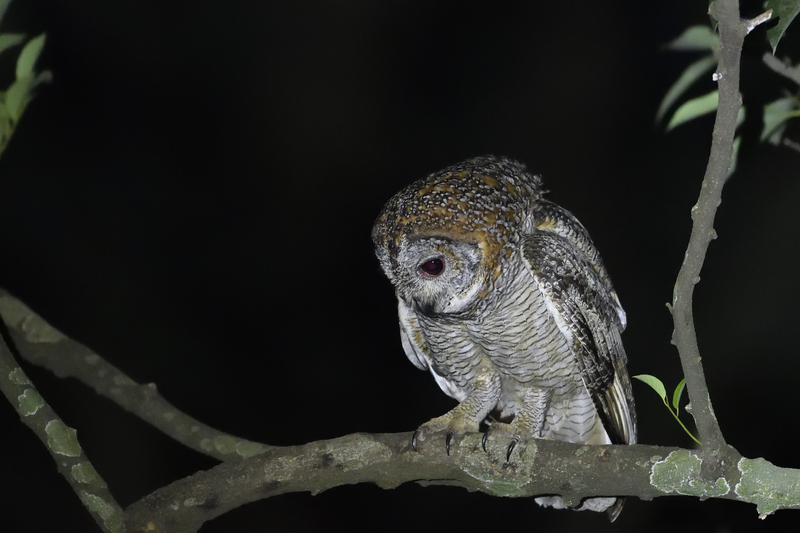 Had my first taste of a night birding experience a couple of weeks back at Thattekkad. When it was mentioned I was a bit unsure of what to expect – how would one spot subjects in the dark, what setting should one use for ISO, what exposure compensation to dial in and more importantly, what about other wildlife (snakes, etc). Many of the photography techniques were very quickly understood within in the safety of Eldhose’s property while we waited for the Mottled Wood Owl to show up. Apparently, this one did have a specific routine – it would show up around 7pm, alway perch on a specific branch for a few seconds, make a dive for its feed, grab it and fly away, And it would repeat this routine a couple of more times. Ideal condition to get the hang of everything that one needed before setting out into the forest. The interesting learning was how silent the owl flies given its size. While watching through the viewfinder as it arrived at its designated perch, I could not hear the sound of its wings. Its arrival was absolutely silent. One second there was nothing and the next moment was the sight of it flying in and perching – if I was not paying attention I would have missed it. This video of an experiment by BBC Earth explains why that is so. Basically it has to do with how their feathers are structured to allow air smoothly over them with minimal wake turbulence (which is what creates the noise). Read this link for more on that. Walking into the forest in the dark of the night was a surreal experience. It was absolutely pitch dark and we could just make out a couple of steps ahead of us using the light from our torches. Nightjars are extremely well camouflaged birds and I have had trouble spotting them even in broad daylight. 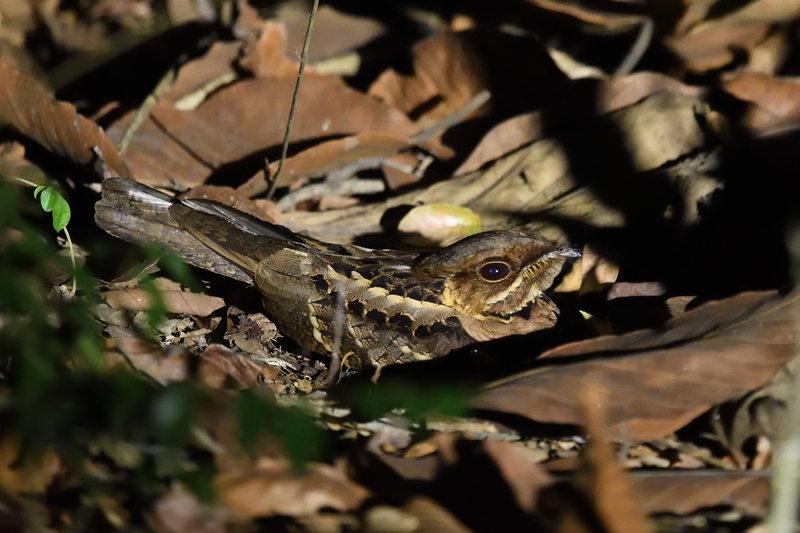 How Eldhose spotted this Jerdon’s Nightjar in this darkness is something that I will always wonder about even though I do know that the lights just reflect back from their eyes making that the best way to spot them. 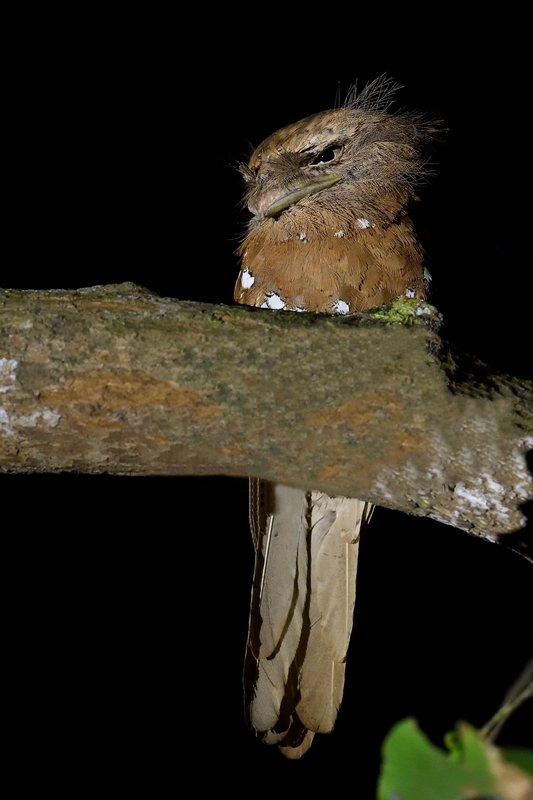 It was time to go after our target bird that night, the Srilanka Frogmouth. I had seen a pair roosting in the daytime that morning and was looking forward to see how they look in their natural and active environment. The only way one would be able to spot them would be to play a recording of their call , hope that there is a response and follow that response to locate the bird. We got lucky at the first instance as the call attracted an inquisitive female. Mission accomplished, it was time to head back with memories and images of a truly surreal experience.